Free lunch always tastes better! Thank you qponxris for sharing this great lunch opportunity! 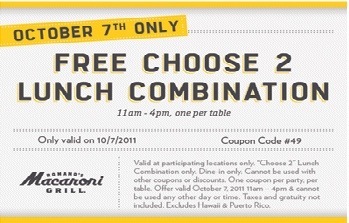 TODAY only, choose 2 free lunches at participating Macaroni Grill Locations! It is only from 11-4 today so be sure to print this out and go check it out! There is a Macaroni Grill literally half a mile from my office and I have yet to try it so maybe this is my opportunity to try something new! This deal offers 2 free “lunch combinations” which is your choice between plates such as: fresh greens, capellini pomodoro, carmela’s chicken, caprese panini and more! Let me know if you go! Happy Friday!